Summer 2018: EBV meeting in Wisconsin! Congrats to Dana on finishing her Master’s degree and graduating this Spring! Dana, Dr. Adamson and Steven. Two of our Undergrads, Chianti Brooks and Kyla Smith, graduated this May. Congrats to both! Kyla and Dr. Adamson at the graduation. 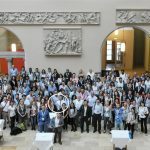 August 2016: EBV meeting – Zurich, Switzerland! Spring 2017: Undergraduate Research Awards won by our Undergrads! Presentation: Miller, K.* and Adamson, A. Effects of Organophosphates on Epstein-Barr Virus Life Cycle and Lymphoma Formation.